‘I am putting myself to the fullest possible use, which is all I think that any conscious entity can ever hope to do’. We are here tonight to celebrate those extraordinary Awards nominees who have, in the words of HAL, put themselves to the fullest possible use. Each of the nominees have demonstrated hard work, persistence and determination not only to perfect their own lawyering skills and to meet the needs of their clients and the demands of the Court, but also to guide and mentor others and to shape the legal profession as we navigate through a rapidly and radically changing legal market. My name is Holly Lam and as President of the Women Lawyers’ Association of New South Wales, I welcome you on its behalf to the 2017 Women Lawyers’ Achievement Awards Gala Dinner. I would like to begin by acknowledging the Gadigal people of the Eora nation on whose land we meet tonight, and to pay my respects to their elders, both past and present. We are privileged to have Yvonne Weldon, the current Chairperson of the Metropolitan Local Aboriginal Land Council, joining us tonight to perform the traditional Welcome to Country. Yvonne is a proud Wiradjuri woman and maintains strong ties to her homelands of Cowra and the Riverina areas in New South Wales. Yvonne is a former student of Redfern Public School, Cleveland Street High School and St Scholastica’s College. She is a graduate of the first intake of the Australian Indigenous Leadership Program. Yvonne has worked in senior positions in Aboriginal policy development, health, human services, child care services, child protection, housing, disability and Aboriginal heritage. 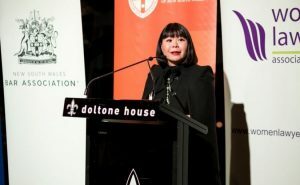 In addition to her role as Chairperson of the Metropolitan Local Aboriginal Land Council, she is also a member of the Aboriginal Children’s Service and a number of interagencies throughout the Sydney Metropolitan area. Yvonne has a passion for health, Aboriginal rights, children’s rights, education, research and evaluation. She recently received an award from the Australasian Evaluation Society for her contribution to the Evaluation of the NSW Aboriginal Child and Family Centres and has recently been awarded a Cultural Diversity Scholarship from the Australian Institute of Company Directors. I now hand over to Yvonne. The last Awards Ceremony was held in 2015 and in the past 2 years, how the world has changed. most importantly, we now have the first woman chief justice of the High Court of Australia. Chief Justice Kiefel – you are an inspiration to us all. The Association’s theme for 2017 has been ‘Tomorrow’s Leaders’, a theme that was chosen to reflect our priority of ensuring that women lawyers today are prepared for a tomorrow that will look nothing like yesterday. We are living in hugely disruptive times in which the way we work and live is rapidly changing. The ‘more-for-less’ challenge identified by Richard Susskind is going to fundamentally change how lawyers work. And it’s not just clients that are demanding more, lawyers are demanding more too. Partnership aspirations are no longer automatically enough. While we all want meaning and purpose in our work; the ability to decide what work we do and when; and access to justice for all, technology is actually making all these things possible. Technology is being developed at an extraordinary rate enabling virtually anything or anyone to be accessed anytime and anywhere . With the introduction of wifi on planes, there’s now very few places in the world where a person genuinely cannot be contacted – although defendants wishing to avoid service will no doubt argue otherwise. It is predicted that in about 30 years’ time, the average home computer will have more processing power than all of humanity combined. And it’s not just processing power. We have, already at this very moment, moved from focusing on simple artificial intelligence like Rosey the Maid from the Jetsons – that is, the programming of devices to perform specific tasks like humans – to machine learning where we are training machines to recognise data and to think for themselves like HAL did in 2001: A Space Odyssey. Sci-fi movies are starting to move into the realm of reality. For example, Google DeepMind’s program AlphaGo has now beaten the human Go world champion not by being programmed to win in the traditional way – that is, by being programmed to calculate the benefit of all potential moves at any given point in the game – but rather, by learning a general purpose algorithm that allowed it to learn from its own experiences of games it has observed and played against itself to interpret the game’s patterns and decide for itself at each step what the best move is. In other parts of the world such as the US and the UK, machine learning algorithms are starting to be used to accurately predict the results of litigation, the likelihood of settlements and in some cases the dollar value of the settlements. If we can accept that in the potentially near future, a computer is going to be able to independently out think a human and do parts of our job faster and cheaper than we can, we need to think more deeply about what it means to be human and what it means to be a lawyer. What do we, as lawyers, fundamentally offer? What do we do that a machine in 20 years time can’t? There are so many possible answers to that question but I suppose that among the many things we do as lawyers, at its heart, we create, uphold, interpret and develop the written rules of our society to ensure the smooth and proper administration of justice. We act as advocates for those who cannot speak or cannot be heard. And in today’s fast paced environment where facts don’t seem to matter, anyone and everyone can throw out real and fake news to the world and create echo chambers, and trust in our institutions is eroding away, lawyers offer critical thinking and objective reasoning skills that should be used to restrain and counter the excesses of sensationalised extremist viewpoints. Before the machines take over, we need to take every opportunity to collaborate and to ensure that equity, diversity and access to justice is embedded in our systems, institutions, processes and conversations now because there are going to be a whole lot of machines learning from how humans behave and the values our society seems to hold dear and it would probably be best not to turn Terminator 2 or the Matrix into our future. to model the behaviours and attitudes that show junior lawyers how to pursue excellence in a modern, diverse, inclusive and technologically advanced legal profession that respects and values the contribution of all members of the profession. In 2017, we have run a number of events and continued to progress a number of key projects to assist women lawyers in achieving partnership and other career goals. thought provoking law & technology panel events. We have also continued to welcome and encourage new lawyers to the profession with ‘Rising Stars’ and ‘Law as a Career’ panel events and the Janet Coombs lunches for new female barristers. The WLA’s agenda for the rest of the year remains jam packed and I note we are joined tonight by Professor Frank Wu from the University of California Hastings College of Law, who will be delivering a number of talks next week about the opportunities in an increasingly international and transnational practice environment, with Asia embracing the rule of law; changes in the structure of the leading law firms; and how best to include people of diverse backgrounds to achieve better client services and realize ideals of a democratic society. I’d also like to invite you to the launch of the Advancement of Women in Law Firm Project and this year’s Law Firm Comparison Data Report on 19 September 2017 and also to keep an eye out for the WLA’s ‘Welcome to the Law’ workshops aimed at aligning the expectations of recent law graduates with the realities of legal practice. So, returning to tonight, we are delighted to recognise and celebrate the achievements of the outstanding women lawyers, mentors and firms that have achieved excellence in their area of practice and have helped created opportunities for women in the law. The nominations were exceptional and on more than one occasion, the judging panel felt it necessary to award special commendations. We are grateful for the support for the Awards this year from the Law Society of NSW, the NSW Bar Association, the Department of Justice, the Association of Corporate Counsel, Australia and the Workplace Gender Equality Agency. We also extend our special thanks to each of the Award Prize Sponsors, affiliated supporting organisations, the NSW Bar Association as our Major Awards Sponsor and Allygroup as Awards Media Sponsor for their generous contributions. In particular, we thank the Law Society of NSW as our Principal Sponsor for their ongoing support, and Crowd & Co as a new Silver Sponsor this year. Again, on behalf of the WLA, I welcome you all tonight and hope you have a wonderful evening. If you are unable to tear yourselves away from your smartphones or are taking selfies, please make sure that you upload them onto Twitter, Facebook, LinkedIn and Instagram with the hashtag #WLANSWAwards. If you don’t know what that is, don’t hesitate to ask me or someone in this room – with more than 500 lawyers here tonight, I’m sure someone will know what to do.